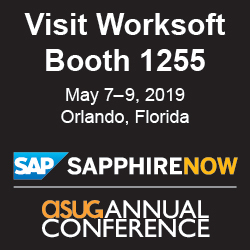 Connect with a Worksoft expert at SAPPHIRE NOW to learn how automation can support your digital transformation. This year at SAPPHIRE NOW, the Worksoft exhibit will feature an in-booth theatre with a variety of insightful presentations from customers, partners and our team of automation innovators. Stay tuned for details on times and topics. Stay up to date on our latest SAPPHIRE news and more via your preferred social channels: LinkedIn, Twitter or Facebook.